Hello Fabricworms! With an eye for the vintage-eclectic, Bari J. designs collections that take you back to a period in time where poise and elegance were at its peak. The intricacy of her designs will leave you speechless and her use of color and florals give life and meaning to her coined term “funky vintage." 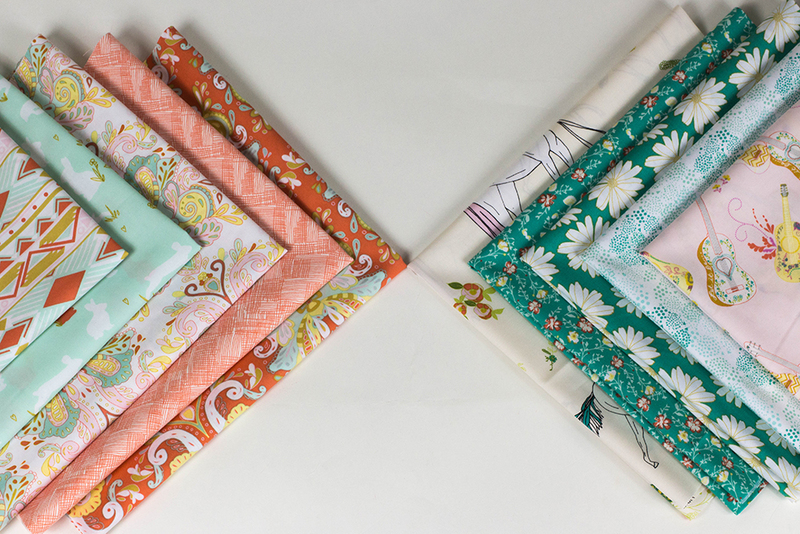 Enter to win a fat quarter bundle of her latest collection, Anna Elise. Kind-hearted and free spirited, Anna Elise enjoys the world around her which is brimming with color, music and imagination. Join her for a horse-back ride in a universe colored in ocean weave, rosebud, and sirocco. This giveaway ends on Sunday 6/28 @ 12 am PST. The winner will be contacted shortly after by email. The winner will be chosen randomly by Gleam. Love Bari J and Love this collection! Thank You!!! Would love to make a quilt with this! I would love to make a quilt for my free-spirited little girl! Thanks for the chance to win! Horses! My daughter would love the horses. Beautiful fabric. I would use fleece for pjs or a quilt back. this would be perfect for another quilt, because you can never have too many. This line is so gorgeous. I love everything Bari J does! How lovely! Bari J rocks! Something snuggly for my grandaughter. Pink is her favorite and red is mine. Sweet baby quilt and baby gifts! Lovely. Thank you for showing this collection. Thank you for the chance to win it. I'd love to make some PJ pants in pink or purple. Such lovely and unique fabrics! I would make pjs out of the sky blue fleece. HELLO FABRIC WORM! WHAT A NEAT BUNDLE-GIVEAWAY! I'D MAKE 2 BABY CHARITY QUILTS! LOVE THE BLUES IN THE FLEECE! THANK YOU FOR SHARING! This entire collection is adorable! Love it all. My favorite color of fleece is lavender and I'd use it for a cuddly stuffed toy or two! Love it! They are perfect for a project for my two young daughters! These fabrics are gorgeous! I could definitely see myself making a drawstring sleepover bag for my girls! I would either make pillowcases or a quilt for a child out of these. Pillows for the bed would be great too! I love any neutral. These fabrics would make an amazing quilt! Perfect blend of vintage and whimsy! Easy! Depending on the pattern of the organic fleece I would either make a toddler quilt or cut it up into 5"X7" squares to give to the babies in the NICU. I would make a baby blanket. My favorite color of fleece is pink. Hmmm.. I don't know. A baby blanket maybe? Or maybe some pajama pants! My favorite color of anything is either blues or purples. I'd love to make a cozy lap blanket! I like blues and greens - I'd make a lap quilt for next winter! Fabulous collection! I'd use it in a quilt. Thanks for the chance! My favorite color is blue and violet and I would make a quilt for a teenager. Wow! Truly wonderful collection! It would be an honor to create something special with these! Thank you for the chance!! these will be wonderful for a quilt for my granddaughter. Beautiful! I would create a wall quilt for my sewing room for inspiration! My favorite color is aqua. Bari. J is one of my favorite designers, I am always sewing for everyone, if I won this fabric I would make a quilt for myself lol. Thanks for the chance to win! I love this! Has a fun vintage vibe! What an adorable collection! I think I'll make a quilt out of it. I'm a new Grandmother to a beautiful baby girl, Emerson and her mother asked me to make her some cute new bibs and while searching the Internet for fabric I was drawn to yours and would love some pieces to use for my project the colors we love to use for her are pale pink, lavender and mint, thx!! Some beautiful purple fleece to make a sweatshirt for the coming winter! I think organic fleece would be fabulous for a baby quilt! Also great for neck warmers. My favorite color in that is Coral, and I also love the Teal. I would make burp cloths and diapers for my new grandson Zion. I would love to gallop off with this beautiful collection! 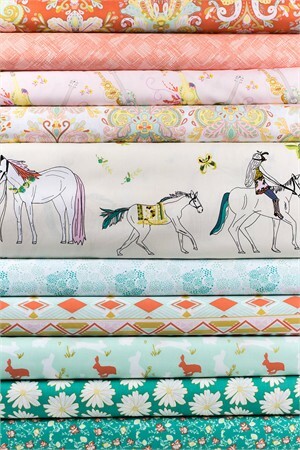 I envision making some dreamy pillowcases out of the horse print fabric. 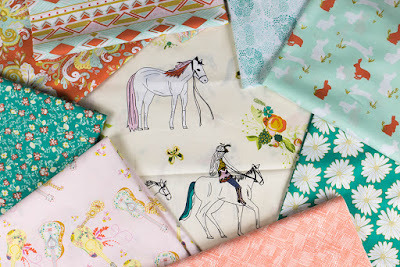 would love to use these fabrics! Pretty pretty! I'd patchwork it up for something fun for my daughter.